The violent chaos over the anti-Islam movie, the innocence of Muslims, hit the UK last week, as Muslims burnt US and Israeli flags outside the American embassy. Protests have now spread to Birmingham, due to the West Midlands being hugely populated by Muslims, the protest began in the Bullring, Birmingham’s main shopping centre/Mall. 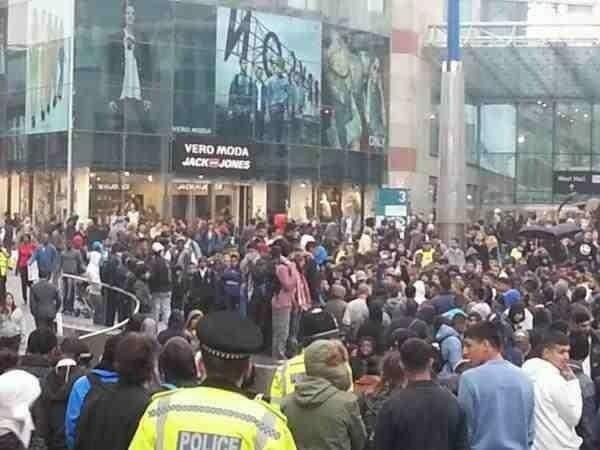 A friend of mine, as well as many others, is currently unable to leave the bullring as the Police have sealed the shopping centre to prevent the protest becoming agitated, he will receive a parking ticket and penalty fine, due to being held for hours longer than his allotted time, thanks to the Muslim protest. 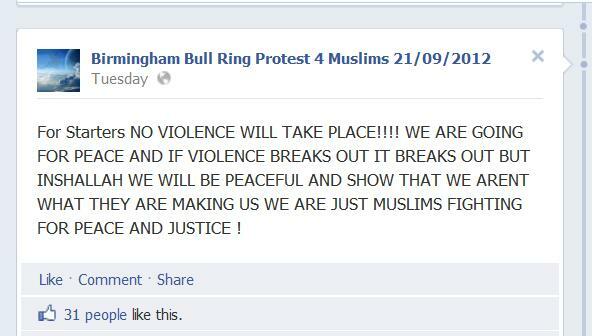 The protests Facebook page, which states the protest is for Muslims only, contradicts itself as it states the following, that no violence will take place, but, if violence breaks out, it breaks out. The Facebook page has been flooded with angry messages from non-Muslims and Counter-Jihadists, this making the Muslims upset.. again. Many businesses lost valuable hours as they closed their businesses early to avoid possible Muslim violence. Thanks to the huge police presence, the protest ended fairly without incident, apart from Muslim youths involved in scuffles with the public and police and running around the city and throwing stones at police officers. This entry was posted in Collapse Of Law and Order, Islam in Europe. Bookmark the permalink.